Audio Technica ATM230–a New Standard in Tom Mics? 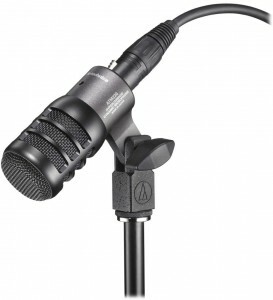 If you’re in need of some tom mics, check out the Audio Technica ATM230. These relatively new mics are getting rave reviews, and receive favorable comparisons to many classic tom mics, including the Sennheiser MD421 and e604, Shure SM57, and Audio Technica’s own ATM25 and ATM23HE. One forum post commented that based on the specs, the new ATM230 is “…basically an ATM25 in an ATM23HE housing”. The ATM230 normally sells individually for $139, or can be purchased new in a 3-pack for $349. Zzounds even has a steal of a deal on a warehouse resealed 3-pack for only $220! Each mic includes a zippered storage pouch and a drum rim clamp.